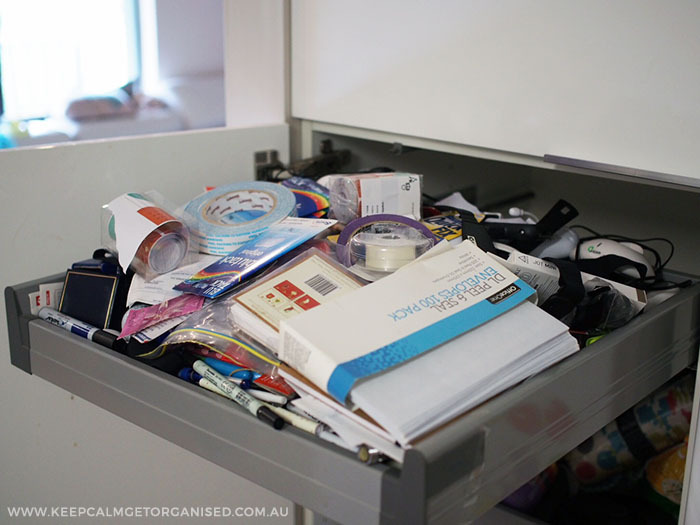 Do you have a drawer or shelf in your house that collects random bits and pieces and is constantly in a cluttered mess? I’ll confess that I do (well I did!). It was in my kitchen and was otherwise known as the junk drawer. It was mostly full of stationery and other bits and bobs, but it was totally disorganised and impossible to find anything in it. I decided it was time for some order, so I decided I would organise the junk drawer and work out a system for keeping it that way. So far it has only been a week but it is still in order and I’m finding it easy to manage. Here’s how I did it and some before and after photos. 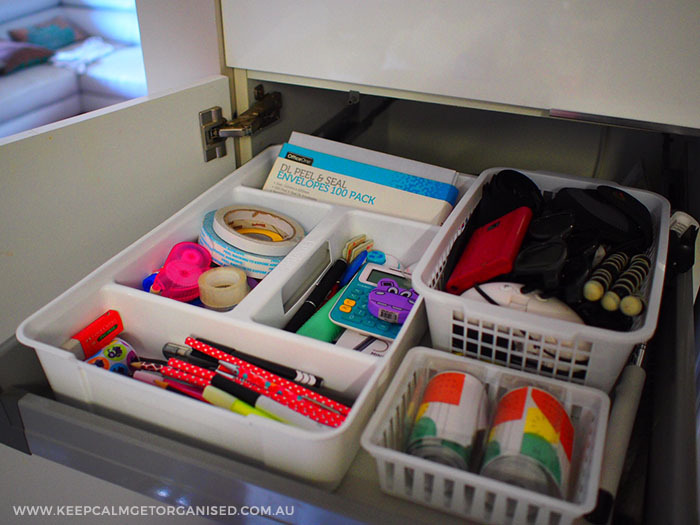 Plus my top tips for organising the junk drawer at your place. Should you have a junk drawer? Before we jump in with how I sorted and organised mine, let’s address an important question. Should you have a junk drawer in your house? I’m not going to answer that directly for you, but I would suggest you consider whether the drawer has a purpose? If it really is a drawer for things that don’t have a home or for random junk then the bigger issue is probably creating appropriate storage for things. When I talk about a “junk drawer”, I’m not really referring to a drawer for junk (as in rubbish or clutter), I’m talking about a multipurpose drawer. One for miscellaneous items that don’t necessarily belong together but are needed frequently. 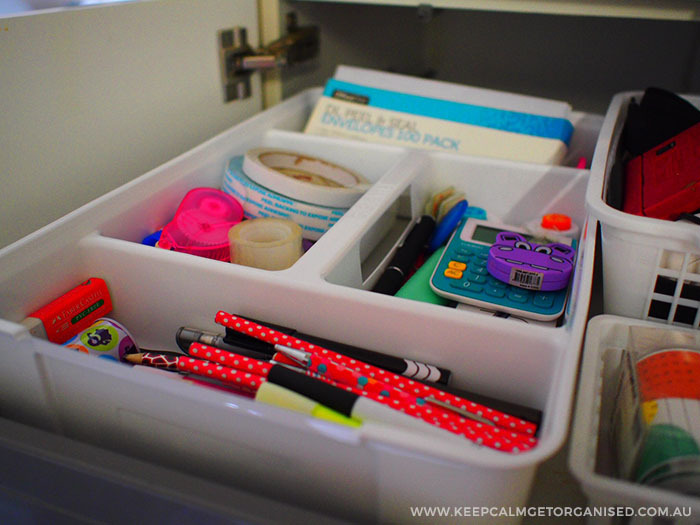 In our home, the “junk drawer” is for things that I need often, usually in the kitchen, but that don’t necessarily belong together. 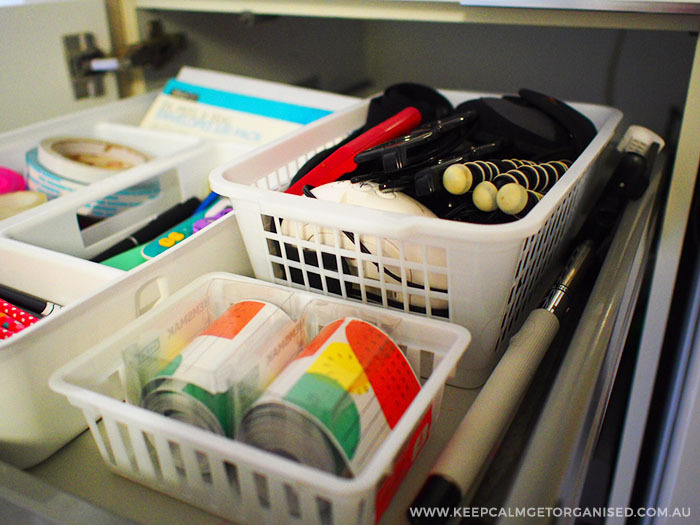 It is mostly a stationery drawer but also contains things like camera and phone chargers, kitchen labels and stamps. It has a purpose so I think it is worthwhile. As you can see from the photo below, my junk drawer was getting out of hand. It was so full that things would fall out if I tried to find anything in it. In fact, I didn’t even really know what was in it anymore. As it turns out, when I started clearing it at least half went into the bin. I knew I wanted the drawer to be for stationery that I needed frequently, plus things like phone and camera chargers that I needed but didn’t want out on display. I started by clearing out all the rubbish and things that had ended up in there as a temporary home but never made it to their real home. This alone reduced the drawer by half. I then categorised what was left. Basically pens/pencils, sticky stuff (tapes,blue tac), post it notes/labels, measurement tools, chargers and kitchen stickers. Once I knew what I had and what I wanted to keep I used a kitchen utensil divider that I’d bought at Woolworths for $10. I also like that it has a handle so I can pull the whole thing out to move it to the table if I’m going to need to use multiple items at once. I used a cutlery divider to keep everything organised. There was extra space left so I put in two little baskets I had for the kitchen labels and all the chargers. The ruler and some camera equipment didn’t fit so they are down the site. Little baskets for keeping things organised. Basically the drawer is used for everyday stationery and my camera and phone equipment which I use daily. We don’t have a study or office so it made sense to have a set place for stationery within easy access. I’m loving my new organised junk drawer. The sections really help. So far the drawer is working well and has stayed completely “junk” free. It’s nice to be able to just grab what I need without digging! Do you have a junk drawer? Is it out of control like mine was?